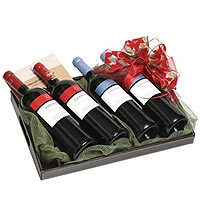 Product description: A gift of flowers is the perfect gesture, always guranteed to deliver your message perfectly. These beautiful 17 coloured roses are elegantly surrounded with greens and tied with bow. 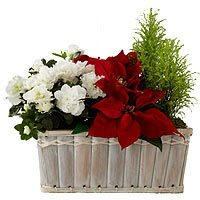 Plant with New Year flavor to the festive basket for your home or for a social event. 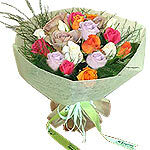 Send flowers to Athens, Greece and overseas with Interflora. A gift of flowers is the perfect gesture, always guranteed to deliver your message perfectly. 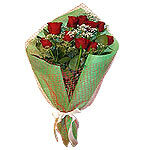 These beautiful 17 coloured roses are elegantly surrounded with greens and tied with bow. Send the softness and beauty of these flowers and warm someones heart. 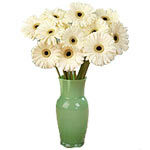 These white gerberas shows purity of your heart to the recipient. Send that special someone three times delight by giving this stunning fresh flower arranged with plush bear and delicious candy.